Marrakech is one of the imperial cities of Morocco and capital of the mid-southwestern region of Marrakesh-Tensift-El Haouz. 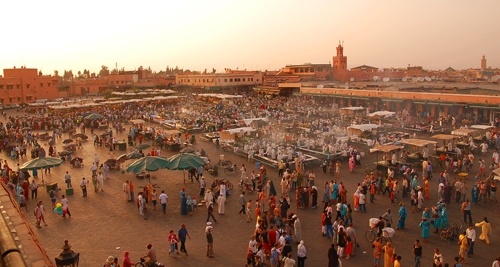 With a population of 920.000 (2010) Marrakech belongs to the largest cities in Morocco. It is a city of contrasts, where history commingles with modernity. The old, historical city of Marrakech, Medina is full of intertwining narrow passageways with vendors and their stalls. The heart of Medina is Jemaa el-Fna square, a vibrant marketplace. In contrast, Gueliz plays host to modern restaurants, fast food chains and big brand stores.